Bag-in-box (BIB) packaging has been around for over 50 years and is well established in the food, beverage and pharmaceutical industries. It was introduced for the lubricants industry some years ago, but was limited due to perceptions that it was not a serious contender for packing more aggressive products other than those in the food and beverage market place. Now, Quadpak and European corrugated partners have developed a BIB package specifically for oils, lubricants and chemicals. This is the first BIB package certified for UN transport of hazardous goods. The approved package is certified in 3, 5, 10, 15, 20 and 25 litre sizes for Hazardous Goods Classification Groups 2 and 3. UN certification indicates that the package has been tested in accordance with the recommendations of the United Nations Committee of Experts on the Transport of Dangerous Goods. To be certified, packages must pass a series of tests intended to ensure that packaging containing the hazardous materials can withstand extreme conditions of transportation. 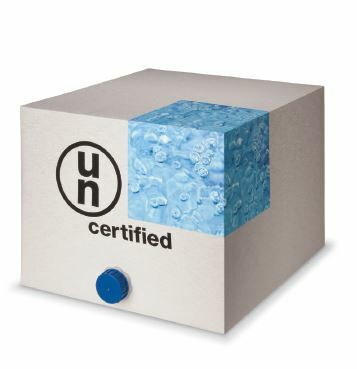 The UN certification covers the vast majority of products in the chemical and lubricant sectors, these industries are now taking full advantage of the environmental and space saving benefits of bag-in-box packaging, an option that until today was not available.